Meg and little bird organic's raw caramel & banana brownie, and apricot logs. 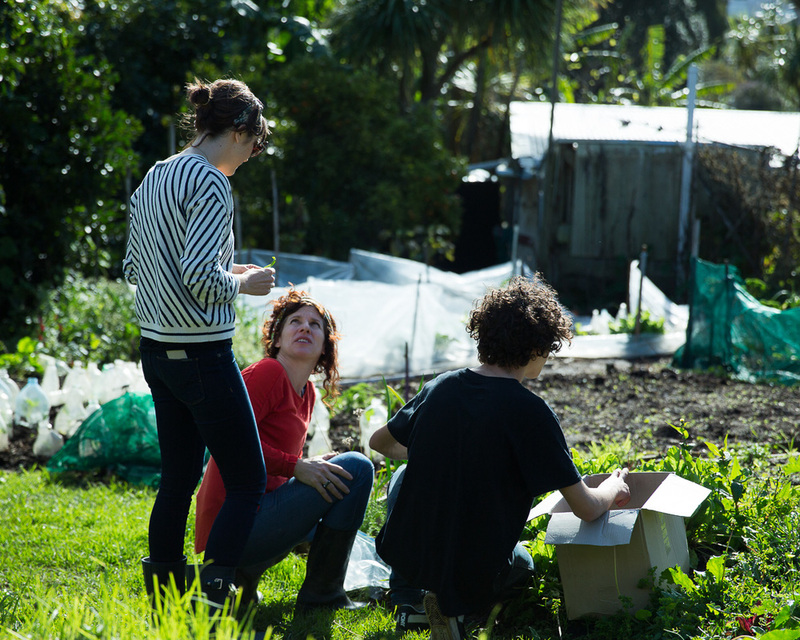 Some more pictures from the Grown and Gathered year round harvest workshop with little bird organics, at Kelmarna organic city farm in Auckland. Also, Meg's raw caramel and banana brownie recipe from the Unbakery cookbook, which was enjoyed by workshop goers on the day. Truly delicious. Enjoy! Herbal teas of kawakawa and nettle - why not brew direct from nature? Wild mushrooms foraged by Matt & Lentil. Start with the caramelised bananas if including this step. Slice bananas horizontally to get 5mm slices (approx 4 to 6 slices per banana). Place the slices on a dehydrator sheet and drizzle with lemon juice, then sprinkle with coconut sugar. Dehydrate for 6 hours at 46 degrees celsius. Mix the pecans into a flour in your food processor and set aside. Process the dates and vanilla extract until they form a paste. Scrape the dates from the side as you go. Add sweeter and blend until you get a lighter coloured mixture. Add the pecan flour and blend until combined. Set aside, while you make the base. Mix brazil nuts into a coarse flour in a food processor - there should still be some nut chunks. Place in a bowl and mix with the cacao powder and sea salt. Set aside. Blend dates into approximately 5mm chunks in a food processor. Add the avocado and vanilla and blend again until there are no chunks of avocado to be seen. Add the brazil nut and cacao mixture and pulse until well combined (be careful not to over-mix, you want the mixture to be coming together whilst still retaining some of the texture from the brazil nuts). Line a 20 cm slice tin with plastic wrap. Press 3/4 of the base mixture into the tin - you want to make lengthways indentations, creating lines like waves so that the caramel can be set in between the 'waves'. Fill the indentations with the caramel using a spoon or piping bag. Cover with the remaining base mixture, making sure you can't see any of the caramel. Layer the caramelised bananas on top, pressing them in lightly to the mixture. Cover with plastic wrap and refriderate for 4-6 hours. Remove from the refrigerator and cut into approximately 15 square slices. The brownie will keep for 1 week in an airtight container in the refrigerator.